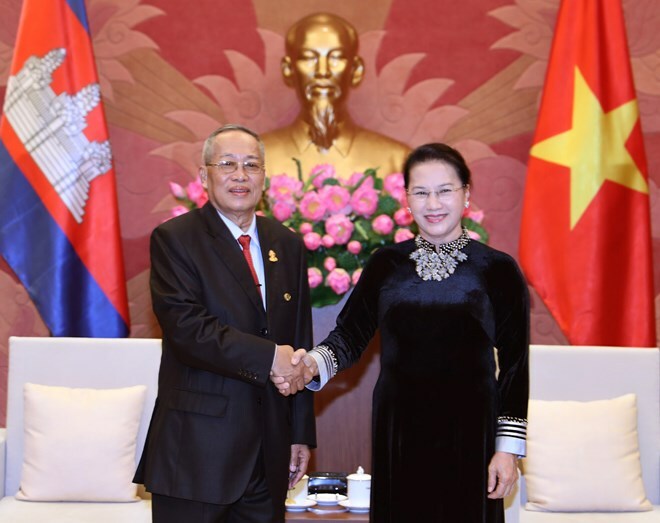 Hanoi (VNA) – The National Assembly (NA) of Vietnam will work closely with the NA and the Senate of Cambodia to promote cooperation between the two countries’ Governments and peoples, NA Chairwoman Nguyen Thi Kim Ngan has said. She made the remarks while receiving First Vice President of the Cambodian Senate Nay Pena in Hanoi on August 9. She welcomed Nay Pena’s official visit to Vietnam when the two countries are celebrating 50 years of diplomatic ties (June 24, 1967). She congratulated Cambodia on the successful communal elections last June, voicing her belief that the elections’ results will be an important prerequisite for the success of the general election in 2018. The NA and people of Vietnam are very happy with the big and comprehensive attainments the Cambodian people have obtained over the past years, she added. Applauding the outcomes of the talks between Senate First Vice President Nay Pena and Vietnam’s NA Vice Chairwoman Tong Thi Phong, Chairwoman Ngan affirmed that the Vietnamese parliament always prioritises reinforcing the two countries’ traditional friendship and all-round cooperation. She also asked her guest and the Cambodian Senate to continue assisting Vietnamese expatriates to settle down in the country and integrate into the local society so that they can serve as a friendship bridge linking the two nations. Nay Pena once again thanked the Vietnamese Party, State and people for helping the Cambodian people escape from the Pol Pot genocidal regime. He noted Cambodia and Vietnam are neighbours who stood side by side in the fights for each country’s independence. Hence, their traditional solidarity, friendship and cooperation must continue to be nurtured by the two peoples, thus those relations will expand to more areas.